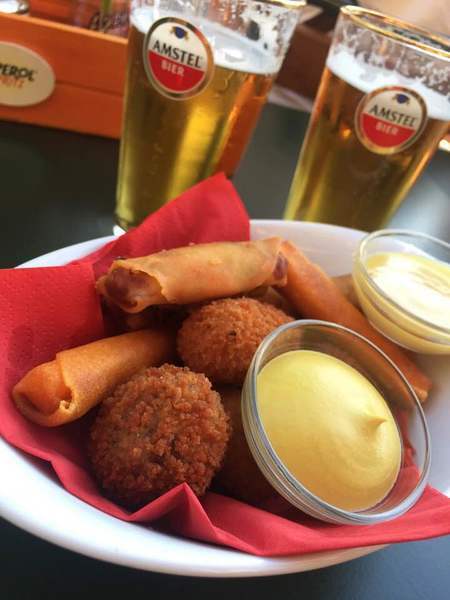 For the ultimate Dutch pub snack sampler, head to The Magere Brug Cafe and order the mixed bitter garniture to sample a variety of traditional Dutch deep-fried finger foods. This 12-piece snack basket has a mix of vegetarian spring rolls, bitterballen (meatballs with beef ragout), shrimp croquettes, goat cheese croquettes, and Topking cheese stems, served with mustard and chilli dipping sauces. These bite-size treats are perfect with beer (go local), and a great initiation to traditional Dutch cuisine.